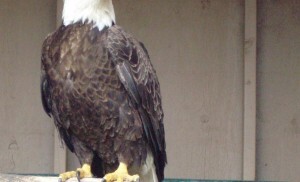 What Makes Bald Eagles Beautiful? If you haven’t stood outside, with a bitter wind threatening to solidly freeze your ears and nose, scanning river and trees on the banks, searching and watching, you haven’t felt it. If you haven’t watched the massive raptor weighing up to 14 pounds with a 7 foot wingspan soar overhead, you haven’t felt it. Why do people spend money, time and energy traveling along the Delaware and Lackawaxen in the dead of winter to glimpse a bird? The first time you see a live Bald eagle you’ll know. When I was in high school, we had no viable Bald Eagle population in Pennsylvania or New York. The pesticide DDT concentrated in the bodies of raptors, particularly fish-eating ones, and caused their eggshells to be so thin that they collapsed under the weight of the incubating parent bird. The few eagles that called our region home could not produce young. DDT had been banned, and its levels were diminishing in the environment, but these large top-level predators needed our help. While I was a student at East Stroudsburg University, wildlife biologists in New York State began the ambitious and relatively new practice of “hacking” Bald eagles in an effort to restore the population. Hacking, or “hand rearing to independence”, is the practice of taking nestling birds from a healthy population, and raising them to release under conditions as close to wild as possible. Almost 200 eaglets over 13 years were raised and released in New York State by biologists and researchers. They came from Michigan, Minnesota, Wisconsin, and Alaska, as well as birds at a captive-breeding facility in Maryland. Professor Larry Rymon and his students were doing the same with ospreys here. The question was not so much whether the birds could survive; that was known from rehabilitation efforts with orphaned birds for decades. What was not known was whether birds of prey “imprint” on their historic site or on the site where they were raised, to return and breed. Eaglets were also provided to be fostered by the state’s only breeding pair of eagles whose own eggs failed. In 1980, the first birds released in 1976 nested near Watertown, New York. By 1989 there were 10 breeding pairs of Bald eagles in New York, and the hacking project ended successfully. During this time, New York’s Bald eagles would migrate south into Pennsylvania during the winter and could be spotted on the Delaware River north of Shawnee to Milford and on the Lackawaxen River. As a college student I was fascinated by the research and had the opportunity to help by hauling road-killed deer onto the ice-covered river (in those days the river was icier) to entice the scavenging eagles into the open where they could be studied. Picture the twenty year old woman hauling deer in the trunk of her 1968 Beetle…. I will never forget the first time I spotted a live Bald eagle. The bird was enormous, her wingspan longer than the deer I had placed on the ice on the Delaware about 100 feet from a boat launch. I was so cold I couldn’t feel my toes. My eyes were tearing from standing where there was no protection from the wind, but I couldn’t move. She was an immature bird, two or three years old, brown with white splotches. Just as I was ready to tear myself away to return to the “warmth” of my Beetle, an adult bird landed on the ice less than 10 feet from the younger bird. His head and tail were so white they nearly disappeared against the ice. I thought I was going to witness a fight, but instead, after some posturing by the older bird accompanied not by the screams we hear on television (which are sound-tracks of hawks) but “chirps”, the younger, but larger bird decided that discretion was the better part of valor, and shared his meal with the adult. Since those days, not only are we blessed with winter Bald eagles migrating south into PA from NY and Canada, we have approximately 100 breeding pairs of our own in the Commonwealth thanks to the efforts of our own biologists and strict protection. No doubt you have seen pictures and video of these impressive birds, but there is absolutely no substitute for seeing our national symbol in the flesh. My husband and I have had the opportunity to work with only a few of these magnificent raptors, and they possess, in addition to immense power, an inner strength and soul that is indescribable. Looking into the eyes of a Bald eagle one can sense the supremacy held by this monarch of the sky. I urge everyone to take a drive up the Delaware before the ice recedes and the eagles return to their more secluded nesting areas. Information on best sighting areas can be obtained by contacting Monroe County Conservation District, Pocono Environmental Education Center, or The Eagle Institute in Lackawaxen (570-685-5960), HYPERLINK "http://www.eagleinstitute.org/" http://www.eagleinstitute.org/ . I recommend a visit to The Eagle Institute’s website because it includes maps, viewing areas, rules of eagle watching etiquette, and basic information about Bald eagles that will make your day more interesting and your experience richer and more successful. Now is the time for your trip. Bald IS beautiful!